Ok, I’m going to get right into it today as it’s Friday, it’s gonna be over 70 degrees this afternoon and for the rest of the weekend, thusly I need to get to the mall and buy some new sneakers to cruise the park in to see all the pretty ladies that break out their sundresses for the first time in 2011. A few weeks back there was uproar in “The Community” about the lack of “community members” included in the Oscar nominations recently announced in January. There is a great wealth of Black talent in Hollywood. Don Cheadle is probably my favorite actor, Angela Bassett is as talented as she is a fox, and Denzel Washington goes without saying; that’s just scratching the surface; I didn’t even get to Terrance Howard, Djimon Hounsou, and The Fresh Prince of Bel-Air. And what about Black directors, there are plenty of them, right? John Singleton, the Hughes Brothers, and the obvious choice, Knicks fan extraordinaire Spike Lee are ones right off the top of my head. And even with that brief look at talent available to produce real meaningful Black films what do we get hitting theaters today? That’s right, yet another cross dressing comedy. Now, God bless Martin Lawrence. If you’re about my age you grew up on Martin with his buddies Gina, Cole, Tommy and Pam; you remember his stand up routines before he was on the big screen and Lord knows we all remember him as Bilal who just needed Chill to stop bumping his DJ table in House Party but, really, wasn’t one Big Momma’s House enough? I know people gotta keep the lights on and their wives and families happy but three of them? Back to my original point though, you can’t complain about what you’re not willing to fix. If you say that you want a porterhouse steak but you keep ripping into the Spam when they bring it out on the fine china then who’s to blame? You think Hollywood doesn’t know that comedies and action films (and cross dressing Black men) move the meter as well as the money from Black movie goers wallets? So why wouldn’t they keep shoveling it out? It’s likely because the suits out west think that’s all you can take. And yeah, folk of other hues, have their garbage films too, Jackass 3-D and anything that Jack Black was featured in; but stop haranguing about the balance in their films and kill that noise about the fact that there are more substantial films on the other side because should 2011’s version of “The Last King of Scotland” hit the theaters you certainly wouldn’t go check for it because Flocka ain’t on the soundtrack and Sanaa Lathan ain’t in it (no knock on Sanaa, mad talented. Respect.). That ain’t what I think though, that’s what they think. And, no, there aren’t enough stories and characters of interest including you folk that warrant the production of dramatic film so we’ll give you a biopic every 5 or so years about a musician or a Black leader like Nelson Mandela who was just done by Morgan Freeman in Invictus in 2009, will be done again by Terrance Howard in September 2011 in the film “Winnie and Nelson” (also starring Jennifer Hudson), and likely done again in 2013 by Chris Brown in Tyler Perry’s “Madea Defeats Apartheid”. Speaking of which, in another decade or so the stink ought to be off Chris and Rihanna’s situation enough that the younger generation can have their version of “What’s Love Got To Do With It”, the role of Chris Brown of course played by Jaden Smith and Rihanna by Keke Palmer; don’t think it can’t happen, remember that movie garnered nominations for Best Actor and best Actress back in 1993. But until then, here, chew on this new version of Big Momma’s House, just like you chewed on Lottery Ticket and Death at a Funeral (a poor remake by the way but you thought it was an original now didn’t you?) and don’t worry your pretty little heads about things pertaining to dramatic film that garner Oscar consideration, at least not this year. We’ll be in touch. But that ain’t what I think, though, that’s what they think. Now if you’ll excuse me, I’m off to the mall to find some sneakers. About the author: Skrap is probably taking all of this too seriously because he has dear friends in L.A. that struggle in the Hollywood rat race to get their dreams put on the screen. Real. Legitimate. Dreams. 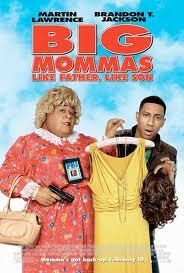 That said, there is no chance that he will see Big Momma’s House: Like Father Like Son. No chance, not even on a dare. I love reading your Blog! Keep it up please! It seems to be some how folk think because you are black you should WANT to see certain movies, that’s a negative. They haven’t gotten a dime of my money for those silly movies. Over the past 15 – 20 in my opinion the majority of the films made in the US are garbage. Thanks for checking in, Mom…I agree. It’s not even a veiled attempt though, it’s pretty much out in the open that Hollywood thinks they can feed you just about anything and people will come running and they can because people have a track record of doing so. What you described above is exactly why films like Mooz-lum couldn’t get distribution through normal Hollywood channels. Hollywood doesn’t think (and with good reason) that “the community” will support anything where polysyllabic words are included in the dialogue or that isn’t accompanied by a hip hop laced soundtrack. At the end of the day, the folks in L.A. don’t care about making so-called “black” movies, they wanna make GREEN movies. Money talks and until we put or money behind material with more substance we will continue to get hot garbage like Soul Plane.